Many readers are aware of the famous Carver Challenge, detailed in these pages (Vol.8 No.6). The Carver Challenge was precipitated by Bob Carver’s announcement that he could make one of his amplifiers sound identical to any other amplifier. Stereophile accepted the challenge, chose the Conrad-Johnson Premier 5 tube monoblock as the target amplifier, and invited Bob out to Santa Fe. Without repeating the details, the result was that Carver could indeed, to J. Gordon Holt’s and Larry Archibald’s satisfaction, make his inexpensive solid-state amplifier sound like the C-Js. He used a technique that matched the transfer function of his own amplifier to that of the C-J. An amplifier’s transfer function is the change between input and output signals imparted by the amplifier. Theoretically, amplifiers with identical transfer functions will sound identical. Removing the unusually shaped top cover revealed more components than are usually found in a power amplifier. 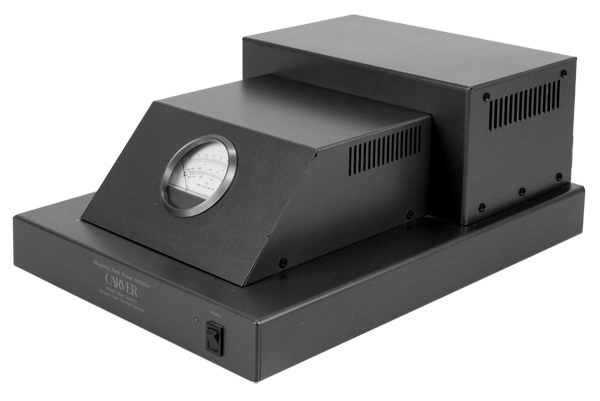 The center of the chassis contains a moderately large power transformer, but not as large as one would expect from an amplifier with a specified 575W power output. Beneath the raised, wider portion of the cover are two 9000µF filter capacitors. Diode rectifiers and additional electrolytics populate the power-supply board mounted parallel to the rear panel. In relation to the Silver Seven-t’s power output, the supply is remarkably small, in keeping with Bob Carver’s “Magnetic Field Power Supply” principle. Indeed, each Silver Seven-t weighs only 17 pounds! Most resistors are carbon composition, with a few metal-film. No op-amps were in evidence. Twenty Toshiba output transistors (10 per rail) bolted to the chassis bottom form the output section. A gold-plated RCA jack provides the input connection, while the amplifier output appears at a five-way binding post. An externally mounted AC line fuse finishes off the rear panel. Can the $2000/pair Silver Seven-t sound identical to its namesake, the $17,500 Silver Seven? Can the affordable transistor version sound even remotely like its cost-no-object inspiration? I was eager to find out. There is little doubt that Bob Carver, using the transfer-function principle, can hand-tweak an individual amplifier to sound like another of dissimilar design. Whether this extraordinary skill can be incorporated into production amplifiers is another question. The first music I played was “Harpo’s Blues” from Phoebe Snow’s first album (ABC SRL-52017). Her voice, normally round and silky, became hard and metallic with an unpleasant edge in the upper midrange. The voice also assumed a more up-front position in the soundstage, without a sense of air or depth. When Zoot Sims’s sax entered, it confirmed the impression of a forward midrange presentation and two-dimensional soundstage. Zoot’s sax, with a very soft treble (footnote 2), took on an unnatural presence edge. I moved on to CD playback from one of my standard references, Return to Forever’s Light as a Feather (Polydor 827148-2). Again, the presentation was bright, thin, hard, edgy, and without depth. I like this music so much that it is rare that I don’t enjoy it. It was totally uninvolving through the Silver Seven-ts. Joe Farrell’s flute was so edgy and strident it made me cringe. In addition, the entire sound was sterile and dry, with little sense of space or front-to-rear separation between instruments. The soundstage was better laterally, with more precise instrumental outlines. Although Flora Purim’s voice had a clearly defined center image, it was homogenized with the rest of the mix at the front of the soundstage. Bass extension was decent, but the Silver Seven-ts were lean in the midbass, depriving some music of its rhythmic drive. Although the Sequel IIs are themselves deficient in this regard, in relation to other amplifiers the Carvers exacerbated the problem. Bass presentation in general was extremely poor. There was no sense of dynamics, control, or pitch. Low-frequency notes were amorphous blobs, without definition. Back to LPs and John McLaughlin’s Belo Horizonte (WB BSK 3619). The entire sound had an etched, “white” characteristic, especially his acoustic guitar. The attack of the string was bright and unpleasant, making me turn down the volume. Wanting to hear more acoustic guitar to confirm or refute my impressions, I played Sheffield Lab’s excellent Michael Newman LP (Lab 10). This is perhaps the most real-sounding classical guitar recording I have heard, especially when played back at a quiet level that matches the volume of the instrument. I once had a classical guitarist roommate, and was fortunate to hear this beautiful-sounding instrument frequently. Even at low levels, the Silver Seven-ts made their presence known. Finger noise was exaggerated, as was the edge of the attack. A certain metallic quality was imparted to the guitar that certainly does not exist on the recording. I returned to CD playback and a disc I’d engineered of a straight-ahead jazz group recorded live to DAT with tube microphones. Conte Candoli’s flugelhorn, normally rich, liquid, and round, had a glare one never hears from the instrument. Bass was thin and decidedly woolly, making it hard to hear pitch. Finally, the performance had none of the excitement present at the recording session. This recording was the coup de grace: I could continue no longer. If the Carver Silver Seven-t has any redeeming sonic characteristics, I could not discover them; instead, I was turned off by its thin, hard, bright character. The sound was unmusical and uninvolving. In addition, bass reproduction was sluggish and ill-defined, robbing music of any sense of excitement. In fact, the pair of Carver Silver Seven-ts were the worst-sounding amplifiers I have heard in a long time, and I am at a loss to explain why Larry Archibald was so impressed with them, as reported in last month’s “Final Word” column (footnote 3). Although they offer massive power output for their price, I cannot recommend them for home music reproduction. Perhaps they are better suited for sound-reinforcement applications where tonal neutrality, soundstaging, and delicacy take a backseat to high power in a lightweight package. As for having the transfer function of a tube amplifier, I have yet to hear tubes that impart the affronting sonic characteristics introduced by the Silver Seven-t. Whether the review samples do indeed have a transfer function identical to the Silver Seven is an interesting question. If they do, then either an identical transfer function does not guarantee sonic duplication, or the tubed Silver Sevens do not sound good. I seriously doubt both of these explanations. On the other hand, if Stereophile‘s review samples did not have the identical transfer function of the Silver Seven, then serious questions arise about the credibility of matching transfer functions in a mass-produced product. Footnote 2: During recording sessions, I have had sax players specifically ask me to try to duplicate Zoot Sims’s round, smooth sax sound.